In case you missed it, here's a look at what made the headlines in the fishing world in January 2013. Famous luremaker Patrick Sebile and his world record largemouth bass catch was easily the biggest newsmaker in January. He caught it last year on Lake Okeechobee, and IGFA finally certified the fish last month. Measuring 24.016 inches in length, it is the new All-Tackle Length Record. While an impressive catch to many, anglers from southern U.S may scoff at the notion of such a fish being called a world record. While the record in and of itself is noteworthy, Sebile's catch is not at all a groundbreakingly huge fish - bass that size are caught routinely in places like Florida and Texas. In fact, Manabu Kurita's 22-pound IGFA world record bass was a whole five inches longer, so what gives? The All-Tackle Length Record was established only two years ago and demands that very strict guidelines need to be followed - including photo and live release - making Kurita's bass ineligible. Sebile's record is easily attainable, so follow the rules here if you want a world record of your own for largemouth bass. 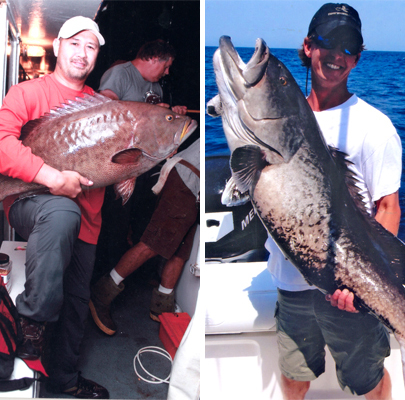 (LEFT) Toby Grantham with his state record scamp; (RIGHT) Timothy Gallimore holds up his record gag grouper. The N.C. Division of Marine Fisheries certified two new records: scamp and gag grouper. Toby Grantham of Knightdale caught a 27.6-pound scamp, making a new record for a fish species that did not previously have any entrants. Because his fish approached the world record of 29 pounds, officials certified the Grantham's catch as being big enough to qualify for a state record. Meanwhile, Timothy Gallimore was approved for a gag grouper record with a beastly 46-pound fish. Gallimore actually caught his fish way back in May 2011, but the Division of Marine Fisheries recently opened up a category for gag grouper, and Gallimore was able to get his fish officially certified. Fortunately for him, he had everything properly recorded back when he first caught the fish. Ben Todd holds up his championship trophy. Two FLW EverStart Series tournaments in January had some exciting moments worthy of mention. In the first, Ben Todd has a couple of 9-pounders to thank for a victory out of Lake Okeechobee. His first fish of the tournament was a 9-pounder, helping him lead the tournament wire-to-wire. Things got tough after the first day, but another 9-pounder in the dying minutes of the tournament on the third day enabled Todd to hold off a surging Trevor Fitzgerald. In the end, the two pros tied at 59 pounds three ounces. In FLW EverStart Series rules, whoever is leading at the start of the final day breaks any tie. Lucky for Todd, his hot start had him in the lead when boats launched for the last time. Click here for more details about Todd's win. Austin Terry holds up his championship trophy. 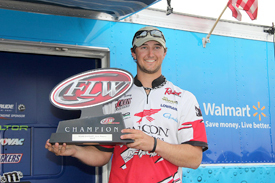 Later in the month, Austin Terry earned his first ever career victory in FLW competition, winning at Lake Amistad. He finished with over two pounds more than his nearest competitor, fully earning that $34,000 grand prize. The rookie actually fished last year in this same competition on Amistad, where he finished ninth. 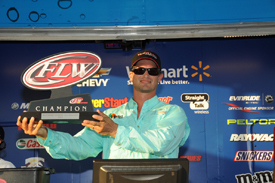 Click here for more details on Terry's first career FLW win.